Finding largest files and largest folders can be really handy in the disk cleanup process. While there is no built-in Windows option to do this there is a FREE Folder Size application that provides this information. 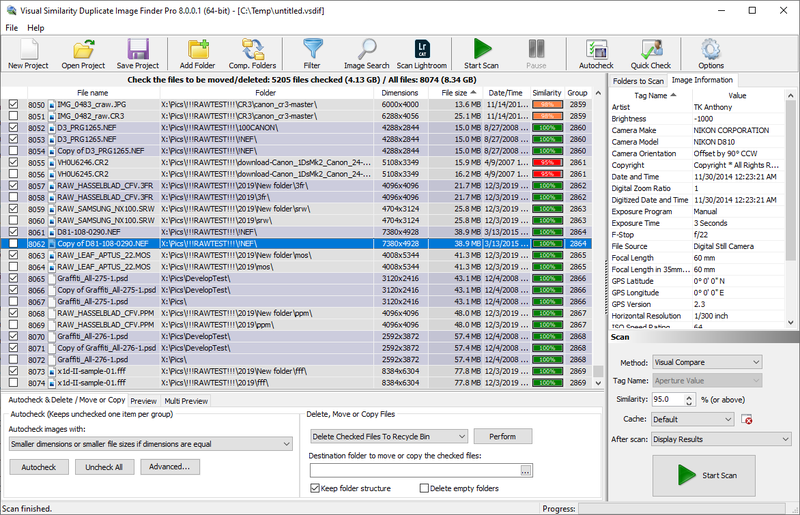 Folder Size is a small disk analysis utility that has also portable version that does not require installation. Listing the largest files and folders is just one of the many handy options of this neat little tool. It can print directory contents, scan network drives, folders, removable media, display the results in pie or bar charts, export the results to Excel, CVS, PDF, EMF, XML, JPG and other file formats. Download and install Folder Size. Once the application is started select the drive or folder that should be scanned. The scan process is extremely fast and should be complete in seconds, but of course that depends also on the drive/folder size and speed. Once the scan process is complete all the files and folders are listed with their sizes and detailed information. See below how this looks. The Largest Files Report is accessible from the toolbar where you can choose the type of report that is displayed in the details view. By default the application displays the “Files and folders” report which is similar to the one of Windows Explorer, but provides details for the sizes of the folders, the count of files and sub-folders inside and many more. In order to activate the Largest Files report, click the arrow next to the currently active report type and select “Largest files”. (see the image on the left). The report in this mode looks like the one on the picture above, but includes the top 50 largest files in the currently selected folder and all its sub-folders. Additional column displays the path for every file. Selecting a different folder from the folders list on the left instantly updates the report with the largest files that are located inside. There is no need to scan anything further. 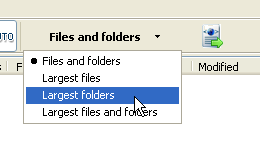 The Largest Folders report is the same as the Largest Files report, but lists the largest folders inside a folder or drive and all its sub-folders. All the information is presented in a neat report that can be exported in multiple file formats or can be printer or saved for further analysis. There is also a graphical representation with Pie and Bar charts and can be used for navigation too. The top 50 largest folders are listed here too with their properties and sizes. This is a combination of the above two reports and displays a mixed list of the largest files and folders. There are plenty of options that can be accessed via the context menu in all reports. There is an option to locate the file or folder in Windows Explorer, show the properties dialog, copy the path to the selected item, delete the item and many more. The option to remove the item from the list gives an opportunity to evaluate the results of deleting it. 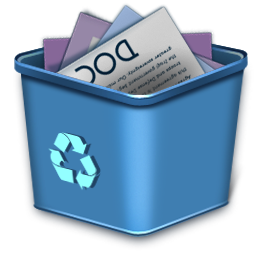 If and item is removed it can be easily restored by invoking “Rescan” on the parent folder that owns it. While there are some similar applications Folder Size is FREE and provides the most accurate results in the shortest time. It is small and does not require much disk space and does not install any services or components that may slow down the system for a feature that is not used daily. Folder Size is a “must have” tool for the disk cleanup process. 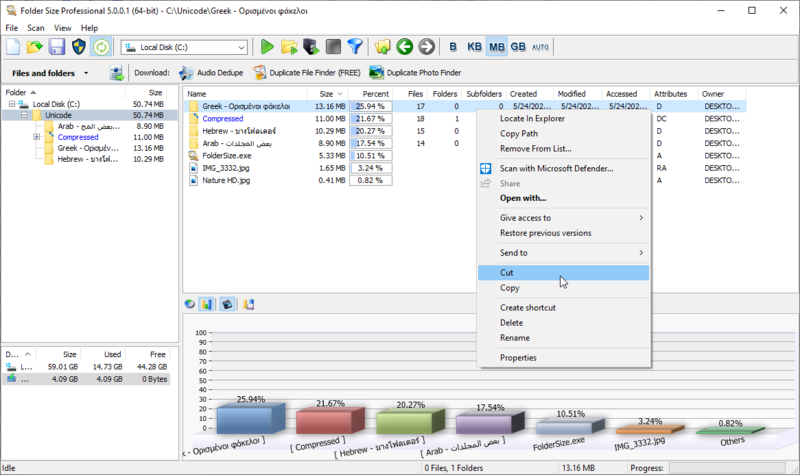 MindGems Inc. provides also some other popular tools some of which have free versions too. There is a free duplicate file finder and web gallery software, duplicate image finder and duplicate mp3 finder. The screen shots above are created with Easy Screen Capture. This entry was posted in Folder Size, Information and tagged Directory Size, File Size, Folder Size, Largest File Size, Largest Files, Largest Files & Foldres, Largest Files & Foldres List, Largest Files and Foldres, Largest Files and Foldres List, Largest Files in Windows, Largest Files in Windows 7, Largest Files in Windows 8, Largest Files in Windows XP, Largest Files List, Largest Files Report, Largest Folders, Largest Folders in Windows, Largest Folders in Windows 7, Largest Folders in Windows 8, Largest Folders in Windows XP, Largest Folders List, Largest Folders Report, List Largest Files, List Largest Files & Foldres, List Largest Files and Foldres, List Largest Folders on May 20, 2013 by MindGems Support. The new duplicate photo finder version is up to 80% faster when searching RAW formats and fixes some issues related to images that do not comply to the standards. VSDIF now better handles also the popular Nikon NEF RAW format and provides improved support for some of the Canon CRW formats. This release adds support for eleven new RAW file formats – .kdc, .srw, .bay, .3fr, .k25, .cam, .nrw, .mos, .dc2, .rw1, .rwl. Find detailed information about these newly supported formats at the bottom of this article. The improved “Browse for Folders” dialog, scans faster folders with many files. In addition to that now you can drag&drop folders from Windows Explorer directly inside Visual Similarity Duplicate Imaged Finder and they will be added to the folders list. There are plenty of other small GUI fixes and enhancements that include also new 32-bit toolbar icons. Click here for complete change log. Bitmap image format used by several Kodak digital cameras, including the Kodak DC40, Kodak DC50, and Kodak DC120; can be viewed using the Kodak software included with the camera or with some third-party programs; also known as a Kodak Photogen file. Digital photo taken by a Samsung digital camera; contains a RAW image captured by the digital camera in a proprietary format; commonly touched up in photo editing software before publishing to the Web or to a digital media publication. NOTE: RAW files are not traditional raster image files such as .JPG and .PNG files because they store additional information such as white balance and exposure. Digital photograph captured by a Casio digial camera; saves raw image data from the camera in a proprietary format; can be touched up with some image editors and then exported to standard raster formats such as .JPG. NOTE: Casio Camera RAW files also use the .RAW extension. Digital photo captured by a Hasselblad digital camera; saves the photo in a RAW format as captured directly by the digital camera’s CCD; used for saving photos natively before applying touch-ups, such as white balance or color corrections. Digital photo captured by a Kodak DC25 digital camera, an older model from Kodak; can be converted to .JPG or other common formats using a converter such as DC25Convert or ReaConverter. Raw camera image captured by older CASIO QV series digital cameras, including the CASIO QV-10A, QV-11, QV-100, QV-120, and QV-200; stores a picture in a proprietary bitmap format; may be viewed by the software provided with the CASIO camera. CAM files were also viewable on CASSIOPEIA E-11 mobile devices using the CASIO’s Digital Camera Viewer software. Raw image file produced by high-end Nikon COOLPIX and digital SLR cameras; saves image data in an uncompressed format that can be processed on the camera or on a computer after the images is captured; similar to the previous .NEF format, but is designed to support Windows Imaging Component (WIC) functions. RAW image captured by several different types of digital cameras, such as the Leaf Aptus series and Mamiya cameras; stores a digital image in an uncompressed format; can be opened and edited using some image-editing applications. The MOS file format was developed by Leaf, a longstanding developer of digital cameras. Several Leaf cameras, including the Aptus series are now developed by Leaf Imaging, which is a subsidiary of Phase One. Camera RAW file created by some Kodak digital cameras; stores the image in an uncompressed format exactly as it was captured on the camera; often imported into photo-editing software for touch-ups and publishing. Camera RAW image created by a Leica digital camera; saves the picture in a proprietary raw format and maintains the original data as captured by the camera’s CCD; often touched up using photo editing software before publishing to the Web, a slide show, or to another digital publication. This entry was posted in News, Visual Similarity Duplicate Image Finder and tagged .3fr, .bay, .cam, .dc2, .k25, .kdc, .mos, .nrw, .rw1, .rwl, .srw, Best Duplicate Image Finder, Best Duplicate Photo Finder, Best Duplicate Picture Finder, Duplicate Photo Finder, Duplicate RAW Finder, Find Duplicate Photo, Find Duplicate Photos, Find Duplicate Photos Windows 7, Find Duplicate Photos Windows 8, Find Duplicate Photos Windows XP, Find Duplicate Raw, Find Similar Image Files, Find Similar Photo Files, Find Similar RAW, Find Similar RAW Files, Photo Sort, Similar Images Finder, Similar Images Search, Similar Photo Finder, Similar Photo Search, Similar RAW Finder on May 7, 2013 by MindGems Support.